People on Twitter love television, often have two screens going as they watch, and are influencers on all things TV-related. These are some of the findings of a new study on TV and Twitter that again highlights how the platform is the home for TV conversation. Conversation around TV programming is always happening. You can see it reflected in this chart highlighting the volume of Tweets around "Game of Thrones." And it is echoed in the research conducted for Twitter by IPSOS MediaCT (IpsosConnectUK), which found that 60% of Twitter UK users have a strong interest in TV shows — 20% higher than nonusers. They not only have a strong interest, but they also regularly talk about TV and seek out more content beyond traditional platforms. This means they embrace on-demand services, online votes, and TV-related mobile apps. Twitter users love to talk about TV. One of the things Twitter does so well is bring people together when they watch great TV shows. Rather than “sitting by yourself to watch, you’re connecting with the wider world.” This insight is underscored by the IPSOS study, which found that 97% of Twitter users have several screens (phone or tablet) on when watching TV. The social buzz around TV drives people to do several important things. Many of those users (41%) take to Twitter to talk about the shows they love. The impact of this Twitter conversation is that it prompts people to tune in and watch — with one in three users saying that they have watched a TV show just because of Twitter conversation. That’s something that Darren Childs, CEO of TV group UKTV (‎@UKTV), has talked about when noticing that Twitter was increasingly where the audience is to be found. “We were starting to realise that huge amounts of our audience — and opinion formers around what was good on television — were very active on Twitter,” he said. So what does this all add up to? According to the study, Twitter is the best platform for TV conversation. With Twitter rated top, the next highest-scoring platform received under half the amount the votes that Twitter did. 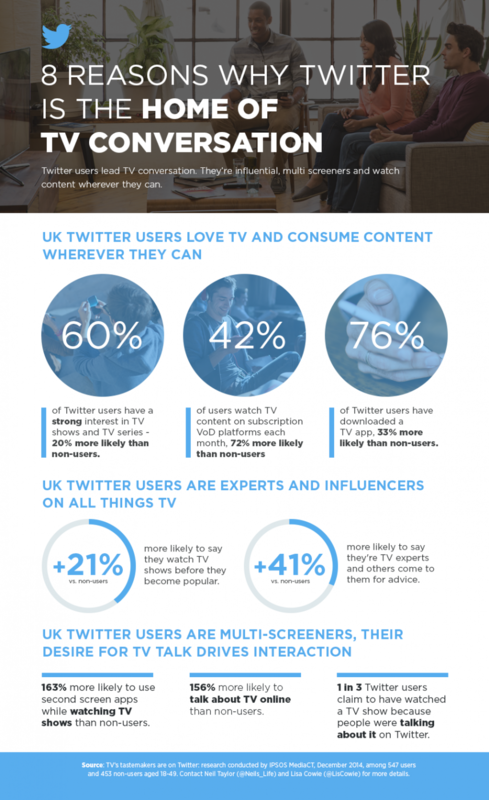 Download the 8 Reasons Why Twitter is the Home of TV Conversation infographic to learn more.